After Jilly at Pension Milou has looked after your pets, no one else will do! You can go away knowing that they are safe, pampered, and loved. My two ‘girls’ are regulars and I wouldn’t dream of sending them anywhere else. Pet lovers everywhere know how important it is that their pets are not only well looked after, but that they enjoy their time away from home. No worries with Pension Milou. Jilly wins ‘first in class’ in my book! Kimberle Meredith, Eze. Owner of Baci, toy poodle. Pension Milou has been a Godsend for me. Jilly provides a family style environment which is second to none. Jilly's experience and knowledge of the individual dog and their particular needs surpasses, without question, any kennel situation. In fact, in most cases Jilly's care is better than leaving your dog with a friend or family member who might not be as attentive or have the time and patience to provide the care required. My little poodle, Baci, continues to greet Jilly, on every visit, with unbridled enthusiasm; thus I am confident he enjoys his stays at Pension Milou with Jilly and his four-legged friends companions during my time away. La Pension Milou est la maison de vacances de mon chien. Chaque fois que nous sommes obligés de nous séparer de Nico, je l'emmène, le coeur "presque léger" à la Pension Milou. Le coeur "presque léger" et en tout cas, en toute confiance car je sais qu'elle aura tous les soins dont elle peut avoir besoin, vivra en liberté avec ses compagnons de jeux avec toujours la présence vigilante et l'affection de Jilly qui est, pour elle comme pour moi, sa deuxième Maman. Après l'avoir déposée à la Pension Milou, je repars, le "coeur léger", pleinement rassurée, sachant qu'à mon retour je vais retrouver mon petit chien, heureux ! Je n'aurai jamais assez de gratitude pour Jilly à qui je dis simplement : Merci. I am an American who used Jilly's wonderful dog caring services quite frequently when I lived in the area. Originally from Boston, Al and I and my 71/2 year old golden retriever arrived in the south of France and knew we would be taking several trips to London, Paris and back to the States. I began right away to try to find a good dog caring place for Knickers. Kennels were ok but not good enough for our very spoiled dog. When someone recommended Jilly to us we set out to meet her and have a "doggy interview" She is very careful when selecting dogs in order to be sure that everyone will get along. Knickers loved her immediately and loved Pension Milou. The dogs are free to roam all over her grounds and in her house. It's safe and she keeps a watchful eye on them all. There are never too many; she grooms them regularly and always checks for any potential problems. While we were away she sent us regular e-mails, including pictures and fun anecdotes about what Knickers had been up to and who his new friends were. Knowing that we had Jilly made travelling a joy without any worries. We called it "Jilly Camp" and Knickers got very excited when we mentioned it. He had absolutely no separation anxiety at all. 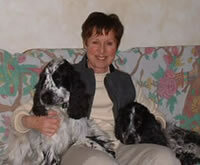 It's hard to imagine that Jilly cares for and looks after our two English Setters as well as, if not better, than we do. William certainly doesn't get his morning toast sitting at the table like he does at Pension Milou. The best dog hotel ever. 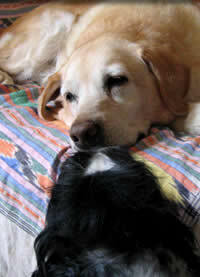 When you read Sheba's story you will understand how much Jilly and Pension Milou mean to us. When Sheba became ill while in her care, Jilly didn't rest until she had helped us diagnose Cushings disease. Sheba was incontinent for a few months before an accurate diagnosis, and became incredibly hard work for Jilly. Nevertheless Jilly found time throughout that period to care for us too, giving us daily bulletins by e-mail and sending frequent photographs to relieve our anxiety. And of course Sheba was not the only dog lucky enough to be in residence! We can't imagine anyone else being willing and able to cope. We not only found a home from home for our dog, but also a dear friend. Sadly, we had to put Sheba to sleep in early June 2003, but we were at peace, knowing that through Jilly we were able to give her the very best of love and care in the last year of her life. We were able to be with Sheba at her end, and we had her home with us for four very happy months before that. We will always be indebted to Jilly Bennett for her commitment to making that happen. Moving here some years ago, we were extremely fortunate to meet Jilly, and our dogs had their first visit to Pension Milou. Living in the south of France, I would say that for our pets it is far more than a 'home from home.' They are given love, care and attention; and the fenced areas where they can roam and play means they have more freedom than with many of their apartment based owners. Our dogs have visited regularly over the years, and to them Jilly is Mum No. 2. We are all very fortunate to have such an efficient, dedicated lady for our pets to visit. If the Guide Michelin granted rosettes for 'dog hotels' Jilly Bennett's Pension Milou would be justifiably proud of three. It is home from home for Bosun and Jilly has our complete confidence in looking after a daft but much loved member of the family. From Ailsa Emmott, La Gaude. Owner Hattie, Cocker Spaniel and Tessa, Golden Retriever. I first started taking my English Cocker Spaniel, Hattie, to Jilly some years ago now, when she was just six months old. At the time I lived in Monaco and not very far from Jilly. Since then I've moved to La Gaude. Nevertheless, the one hour drive is worth the trouble as I know Hattie is well looked after while I’m away. I go away about four times a year for about two weeks, probably at Jilly’s busiest times of the year like August and Christmas. I try and give her a few months notice as I know she can only take so many dogs at a time. I have since bought a second dog, a golden retriever called Tessa. Jilly now looks after both my dogs when I’m away and she has been very patient with Tessa who can be quite a handful most of the time. Depending on where I am Jilly will send photos of my dogs to me via e-mail. I also consider Jilly a friend. When one of my dogs goes through a bad experience I am constantly in touch with Jilly, sometimes several times a day, sometimes for advice, sometimes just for moral support. I honestly don’t know what I’d do without her. Keiron and Kate Mathias, now in England. Owner: Alfie, Jack Russell terrier. Jilly provides a true home from home for her dogs, where they seem to be comfortable, happy and content - Alfie loved going to stay and adopted Jilly as his second mum! Jilly's extensive years of experience with dogs shines through with her genuine affection for each and every dog that stays at Pension Milou. We would highly recomend leaving your dog with Jilly - but beware, they might not want to come home! It is always a pleasure to see Jilly and her dogs at Pension Milou, where Raphie (our 3 year old Golden Retriever) is completely at home. Raphie has stayed many times in the past 18 months with Jilly, who always keeps us up to date with wonderful e-mail photos of the dogs playing. It's clear that the dogs all get on really well. We enjoy our holiday, while Raphie enjoys hers! I have a small Chihuahua/Pomeranian cross, and the thought of putting him through quarantine was one I couldn't bear. Jilly was a godsend, and took great care of Yoda for the six months while I was in England. He gained much confidence in her care and made lots of new friends. I found she is very knowledgeable about dog training and feeding - you really couldn't ask for a better caretaker for your dog. Jilly spoiled Yoda with daily treats - and ensures that dogs are fed individually if they are picky eaters. She lets the dogs roam free in her house and garden - I have been to Jilly's house and can confirm it is a nice house with plenty of room for the dogs to romp. I have extremely high standards for who takes care of Yoda, and I was worried at first that he wouldn't survive the Jilly experience, with me being away from him for 6 months. Not only did her survive it, but he thrived in her care! My wife and I have lived in Monaco for 15 years, we have always owned a dog and have boarded them in many places during that time, but unfortunately the animals were either ill or in depression when they were collected. Julian Darcy, Monaco. Owner Milo, Pug. I always enjoy my visits to Pension Milou. keeps coming back to collect me !
" HOME FROM HOME "
I only once put my dog into a boarding kennel. He hated it and came home thinner than normal and visibly unhappy. Since that discouraging episode I’ve always had a rather unfavourable view of such places as little better than dogs’ prisons, run by people only interested in money. Well, there are exceptions and here we’re lucky to have la Pension Milou on the French Riviera run by Jilly Bennett. What impressed me most with Jilly was that she clearly cares deeply about her guests without being soppy or obsessive (not uncommon faults in some dog people)—and they obviously adore her.